Lemuria is a game by Kuro, published by Tasty Minstrel Games. It is for 3-4 players. In this game, players take on the role of city developers in the ancient and mystical city of Lemuria. Players will work to build buildings and enhance the city in the span of a year. In the end, the player that has contributed the most will be declared the winner. To begin, the board should be placed in the middle of the table. The Altar Tile should be placed on the Star Altar of the board with the arrows aligned. The round marker should be placed on the 1 space of the Star Calendar. The building cards are shuffled and placed face down near the board. The top 5 cards of the deck are drawn and placed on the spaces of the trend line above the Star Altar. Each player chooses a color and receives the corresponding colored player pawn and building markers. They also receive 2 each of the plant materia and mineral materia. They also collect 3 food and 3 gold. The citizen cards are then shuffled and placed face down near the board. Each player is now dealt 3 cards from this deck. Each player takes a look at their cards and selects 1 to give to the player on their left. Once this has been completed, play now begins. The game is played over the course of a year, or 12 rounds. Each month or round consists of 4 phases; start of round, move the altar, players take their turns, end of round. The first phase is the start of round. At the beginning of this phase, the player with the most buildings in each of the 4 building areas earns an area bonus. However this is not applicable during the first round. It should be noted that on the Festival rounds of 4, 8 and 12, players that have at least 1 building in the area gain the bonus. Turn order is then determined. In the first round, turn order is randomly determined with each player placing their pawn on the corresponding turn order number. In following rounds, players place their pawns on the lowest available turn order number beginning with the player that has the lowest total victory points followed by the next lowest and so on. The player on the 1 spot is the first player for the round. It should also be noted that sometimes players will reserve a turn order spot in a previous round. When this happens, players may not place their pawn on the already reserved space. The player then receives any materia they placed on the spot when reserving it. The next phase is to move the altar. This phase is skipped during the first 3 rounds. In this phase, the Star Altar is turned clockwise one section. The first player is allowed to pay 1 gold to turn it one extra section forward or 1 section backward. The third phase is when players take their turns. In this phase, each player will take their turn for the round beginning with the first player. They begin by taking their player pawn off the turn order spot and placing it in front of themself. The player can then perform any of the following actions. As an action, they must seed or harvest materia. This action must be performed once by the player. For this action, the player can choose to either place materia on the Star Altar or they can take back materia from a section. If the player has no materia to seed with, they must harvest instead. Seeding materia may be done with some or all of the materia the player has. The player places materia in an empty slot on the altar. However each section can only hold 1 type of materia, either plan or mineral. The player may also place a materia of either type on an empty turn order space, thereby reserving it for them in the next round. Harvesting materia, the player chooses a section that has been filled in which they have at least 1 materia in. All of the materia is then harvested. If a player wishes to harvest more than 1 section, it costs them an extra gold foe each additional section. The type of resource harvested is determined by the the type of materia that was harvested in regards to the resource indicated on the Star Altar tile. The player that harvested the resource receives as many resources of that type as they had materia plus the number of filler materia. Players that had materia in the harvested section receive a number of resources equal to the materia they had in the section plus half the number of filler materia rounded down. Once the resources have been handed out for the section, the harvested materia is returned to their respective owners. The next action for the player is to build or reform buildings. This is optional and can be done once per turn by the player. To do this, the player chooses a building in the trend line and pays the resources shown on the card, minus any discounts as noted on the board. The player then takes the building and places it in front of themself, gaining the victory points indicated by the card, as well as any trend bonus indicated on the board. Players are only allowed to build a maximum of 8 buildings. The player then places one of their building markers in an empty space in one of the building areas on the board. Reforming a building may be done starting in round 8 and onwards. The player starts off by destroying one of their buildings, along with any citizen living in the building. The player then builds a building from the trend line with an extra 1 resource discount. The old building and citizen cards are discarded. If the player builds a building of the same color, they get a second resource discount. The player then gains victory points like normal but does not place a new building marker. The last action the player can do is to play or buy citizen cards. Like building or reforming a building, this action is also optional. This action can be done any time during the players turn and as many times as the player would like. However, a player is not allowed to play a citizen card during another action. Playing a citizen card, the player pays the amount of food shown on the card and applies the citizen’s effect. The player may then place the citizen in a building if they have any unoccupied. The card is turned sideways and placed underneath the building. The player then gains the victory points shown on the card. If the citizen and the building have matching colors, the player receives the higher amount. If the citizen is not placed in a building, it is discarded to the bottom of the deck. The player can also buy cards by paying an amount of gold equal to the number of cards they have in their hand. If a player has no cards in their hand, they can take a citizen card for free. The player may also exchange cards for a cost of 2 gold. This allows the player to draw a card and then discard 1. The final phase is the end of round phase. Once all the players have taken a turn, the round ends. In the final round, only festival scoring occurs. For the other rounds, the following happens. First the star altar grows. For every section on the star altar that isn’t full and that has at least 1 of a player’s materia, a filler materia is added to the section. Next the trend line is refreshed. If there’s a card in the right most section of the card line, it’s discarded. The remaining cards will then be slid to the right, filling any empty spaces. Any remaining empty spaces are filled by drawing a card from the building deck and placing it on the board. Finally, if the round was a festival round, players gain victory points equal to their occupied buildings. 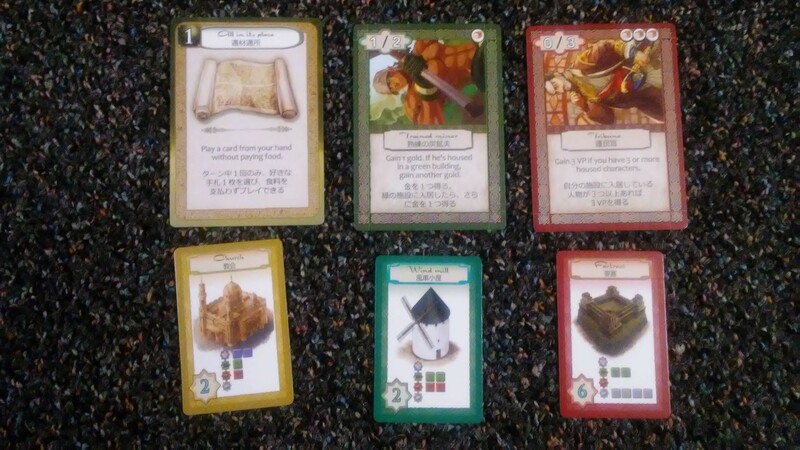 Players gain extra victory points for having the most occupied buildings in a particular color. Once victory points have been awarded, the round marker is advanced to the next position and a new round begins. The game continues until the end of the 12th round. Once this round ends, players check their victory point totals and the player with the most points is the winner. This game comes in a fairly small box, yet it has quite a few pieces included inside. There is quite a few cardboard pieces, including resource markers, building markers and the Star Altar tile. The artwork on these is a little simplistic, but it’s ok. I think some wooden building pieces and some wooden resource tokens would have made it a bit nicer but it would bump up the price of the game a lot more. Speaking of wooden pieces there are some colorful wooden pawns and some scoring discs that are brightly colored. The game also has some plastic markers for materia in the player colors as well. The plant materia are cubes, while the mineral are more like crystals. There are also some black discs for the filler materia. These are also plastic. All of them look nice. The board is really quite nice and reminds me in a lot of ways of the board for Ars Alchimia. It’s the same quality and has a lot of the same feel. Finally there are the cards. I really like these. They have both English and Japanese text on them. The building cards are the smaller euro sized cards. The rest of the cards are all the regular sized ones. I really like the different citizen cards. The art on these is especially nice. The art and theme fit nicely together. Overall I think the components are pretty good. Of course there are some things that could have been improved, but for a small box game it’s actually good. The rulebook for this one is actually a bit like the one for Ars Alchimia in that it’s kind of odd. The book opens an odd way. However once you realize which way the rules go, it’s not difficult to follow. There are lots of nice pictures all over the book. However there aren’t any examples to help you understand things. That part I didn’t like at all. As I was reading through the book, there were several concepts and ideas that didn’t make a lot of sense to me. It would have been nice to have had some examples for clarification. The rules themself aren’t that bad, but as I said, there are some things that were a little unclear. I think that there could have been a little more attention to the book that would have made things better. Overall it looks ok despite the minor issues that I had with it. This game is pretty cool. It’s a worker placement style game with a different type of mechanic. The Star Altar is kind of unusual but makes me think of Tzolk’in’s rondel. It doesn’t work exactly the same way, but does have a harvesting mechanic sort of like that game. Of course with it being a worker placement game, there are plenty of different places to gain benefits from. There is a level of strategy here but is not all that heavy, much like Ars Alchimia. In fact, the game reminds me a lot of Ars Alchimia. It also has a bit of an area control feel as well. As you build buildings, you’ll want to keep an eye on your opponent so that you have the majority in the different sectors of the board. That way they get the most benefits and points from ruling each sector. Like I said, this game looks and feels a lot like Ars Alchimia. That’s probably due to both games being made by the same designer. I think both games have similar qualities but do have a few things about them that make them unique. I definitely like the buildings and citizens in this one and I think the Star Altar is a rather unusual way to get resources. I think players that like Tzolk’in or Ars Alchimia might enjoy this one. I would recommend giving this one a try first. It’s not bad, it’s just a bit different. Different isn’t always bad. Lemuria is a worker placement style game with a touch of area control added in. It’s fairly long for a game of this size. Most game sessions last around an hour and a half, sometimes longer. The artwork is pretty nice especially on the board and the cards. I kind of wish that the resources and building markers had been wooden or something of that nature. 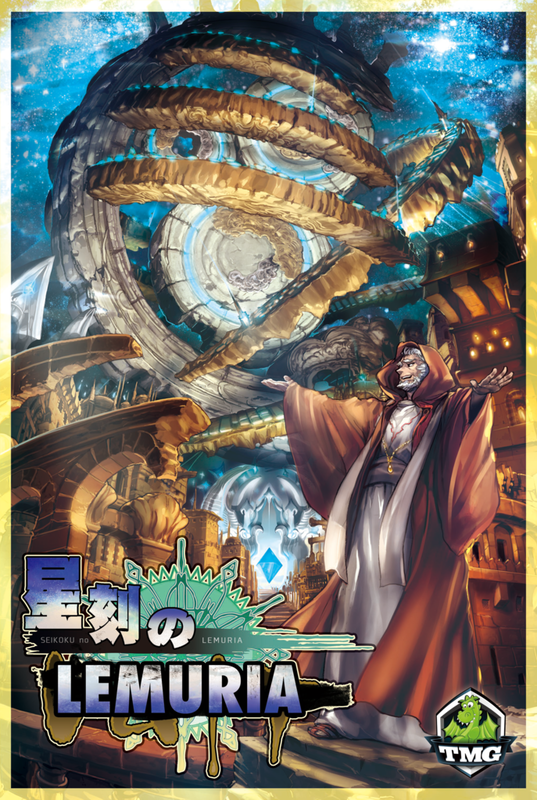 The art makes me think of Ars Alchimia. The rulebook does have a few issues that could have been cleared up with some examples of gameplay. Unfortunately, those weren’t there. It took a while for me to figure everything out. The game is alright and mixes in aspects of Tzolk’lin and Ars Alchimia together. I think fans of those games might enjoy this one. I think overall the game is descent and is worth a try. I would recommend trying it out. You might like it. This entry was posted in Reviews and tagged board, board games, card, card games, games, kuro, lemuria, minstrel, tasty, tasty minstrel, tasty minstrel games. Bookmark the permalink.